Look at this workbook for 2nd grade. It’s 599 pages! That’s like an epic novel, only… not… epic? Well, actually it is kind of epic. We battle through the ELA standards with activities and worksheets in all the Literature and Informational Text standards. Then, we strike off toward the Reading Foundational Skills. That is a brief pitstop before turning our attentions toward Writing and then Speaking & Listening. Finally, we end our epic quest at Language, where we battle the evils of grammar and other fun stuff of the sort! Oh, yeah. We’ve got the sequel ready, too. It’s the Math standards. Your quest begins this time in the lonely village of Operations and it’s nearby suburb Algebraic Thinking. From those humble beginnings, you head out into the uncharted lands of Numbers & Operations in Base Ten. What’s next for our young hero/heroine? Why, it’s Measurement & Data, everyone’s favorite math topics. After such a hefty chore, we end on the easier topic of Geometry. Are you ready for this adventure? Remember, we have created at least 2 worksheets and 1 small group or center activity in each of the standards in these headings. Yes, it’s a great deal of work and effort, but it is for an entire year. 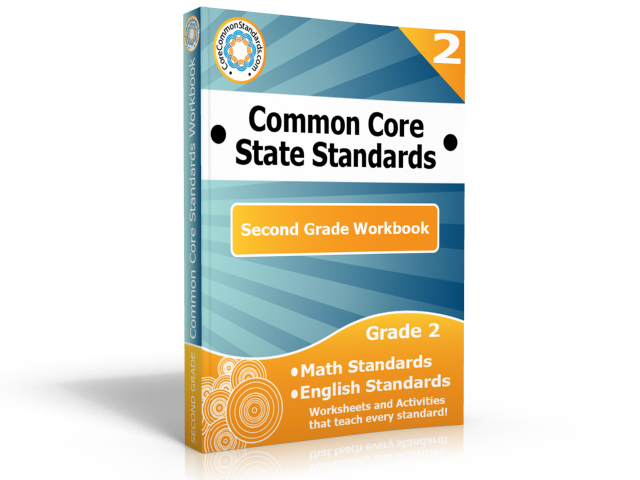 Take a look at our free previews of the Second Grade Common Core Workbook to find things that you can use in your room in your own particular style. Every teacher has their own way of doing things, and we just want to support you! Hopefully it’s an adventure for everyone involved.